We are thrilled to bring LashBeePro’s eyelash extension training to Washington, DC! Whether you are in DC, Maryland, or Northern Virginia (or beyond! ), we invite you to join us to learn this growing beauty service from top East Coast lash experts. LashBeePro’s training focuses on the most up-to-date techniques that will give your clients’ lashes that last without any damage. Learn how to safely apply extensions with focus on proper isolation and application. LashBeePro’s training classes are small (a maximum of 6 students!) so you can expect one-on-one guidance with immediate feedback. Our trainers will provide you with multiple demonstrations and several opportunities for hands-on practice both with and without live models. Not only has LashBeePro developed a cutting-edge training, we also have a full line of products that are designed by top researchers and engineers to be more innovative, safe, and effective. Our products are sourced from the highest quality manufacturers in South Korea. You’ll get a full kit of these products when you sign up for our course, as well as enjoy a lifetime discount on LashBeePro refills! Our eyelash extension training is spread over the course of two days. We dedicate enough time to the topics you need to leave feeling confident at the end of the two days. Our primary focus is to provide you with hands on practice and real life scenarios from our experienced trainers that will position you to become a knowledgeable, successful lash extension artist in the Washington, DC market! Day 2: Practice, practice, practice! Want to learn more about the specifics? Ready to learn from top East Coast lash stylists? Check out details and sign up for our Washington, DC eyelash extension training class this September here. For any email inquiries, keep in touch at hi@lashbeepro.com. LashBee is one of the lash industry’s fastest-growing professional eyelash extension brands. In addition to retailing our professional products online and providing trainings, we have a flagship salon location in Philadelphia. LashBee was founded by two Wharton MBA graduates who saw the chance to help bring the beauty of lash extensions to new markets, particularly focused on the East Coast. We are a beauty company dedicated to developing the best and safest products for lash clients. Our educators are highly-trained lash stylists who also currently serve clients and are constantly working to stay on top of the latest findings in our industry. We are excited to welcome Washington D.C. stylists into the LashBeePro family! So you've finally made the decision to get eyelash extensions and book the appointment! You must be excited! Now what? We're going to walk you through three tips on how to prepare for your appointment and what will happen during it so you get the best results possible. 1. Get a sense of what you would like! At LashBee, each full set starts with a consultation during which we'll ask you questions to understand the look you are hoping for. We'll recommend a set based off of your goals and what is best for your natural lashes and face/eye shape. If you have a sense of what you'd like, we always recommend bringing reference photos for inspiration! Go through the salon's look book or Instagram to see what you like (or even dislike). Please keep in mind that your stylist will only give you a look that your natural lashes can handle. You may want a super long, dramatic look, but this cannot always be done safely given the length/strength your natural lashes. Come in with inspiration but also listen to the expert advice of your stylist since every person's face shape and lashes are different! Overall, we recommend starting more natural since you always can continue to ramp up in drama in your fills. Beautiful lashes take time and require proper care! Come to your appointment makeup free, if possible. LashBee has cleansers available for washing off makeup and your stylist will do a cleanse as well, but you don't want to cut into your appointment time! Extensions need to attach fully to the surface of your lashes for the best bond. Avoid adding anything to your lashes (eyeliner, mascara, etc) for at least 24 hours after. 3. Plan your day out. Depending what type of set you book, this appointment can take anywhere from 1.5 to 3 hours. Make sure to block out enough time in your schedule for the full appointment time and park somewhere with longer parking times! Also, your lashes need to stay DRY for 24 hours post extensions. This means no shower, sweating, rain, crying, or anything else. The adhesive that holds the lashes on take a full 24 hours to dry properly, and any moisture can affect this bond. Ready to book your set? Check out our options at LashBee.com/Lashes. You are also always welcome to come in for a complimentary consultation to ask any questions! Many clients who receive lash extensions often inquire about the timeframe that they should touch up their lashes. At LashBee, we recommend clients to come for lash fills every 2-3 weeks to maintain their newfound stunning lash look. Although this is the recommended time frame, lash fills often depend on the quality of the client’s aftercare. For instance, some clients maintain their lashes properly by cleaning them regularly, sleeping on their back, and by using lash-friendly products. The clients who take the utmost care of their lashes may not need to come back as often. Another indicator that clients need a touch up is if they notice that their lashes are becoming sparse along the lash line. Sparse lashes are a major indication that the lash extensions are falling out. Lash extensions require maintenance including being shampooed, brushed, and cared for. Luckily, with proper lash care, the likelihood of lashes becoming sparse is significantly reduced. Here are our top tips for long lasting lashes! It's best to also avoid hot saunas during this time. If you want an extra glam look, wear water-soluble mascara on just the tips of the lashes. If you aren't sure whether your makeup is extension-friendly, don't be afraid to ask your lash stylist! Don't use eyelash curlers - instead, let us know if you want more curl, and we can select the best extensions for you. If you wear an eye mask, make sure it doesn't crush your lashes or compress your eyes (which can give you wrinkles). Instead, look for masks that cup above the eye area. Brush out your lashes to have the most va-voom look! LashBee will always give you a free aftercare kit, so make sure to speak with your stylist about how to best use it. Feel free to use a lash cleanser before brushing at night to be extra squeaky-clean. When it comes down to it, the key to preserving your lash extensions is to properly take care them. Otherwise, you will need touch ups more often. At LashBee, we gift all of our clients with an aftercare kit to aid with this process. We want our clients to have all the tools they need for beautiful, healthy lashes! Say Goodbye to 9 Lash Myths! With plenty of lash extension myths buzzing around, we feel it's time to clear the air! 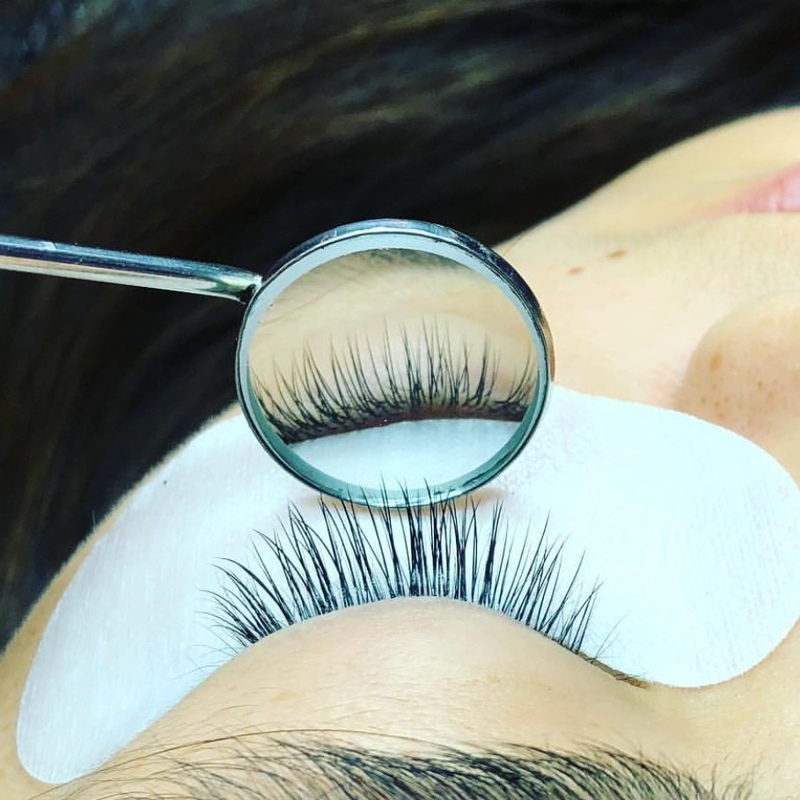 At LashBee, we believe clients should be as educated as possible about their eyelash extensions, so put put together a list of common myths we hear daily. Myth 1: Wearing lash extensions will cause your natural lashes to fall out. LashBee: The truth is, we lose up to five natural lashes each day. When lash extensions are properly applied, they will shed when your natural lash does like normal! Myth 2: Lash extensions prevent your natural lashes from growing back. LashBee: As long as lash extensions are properly cared for, the natural lashes will be safe. 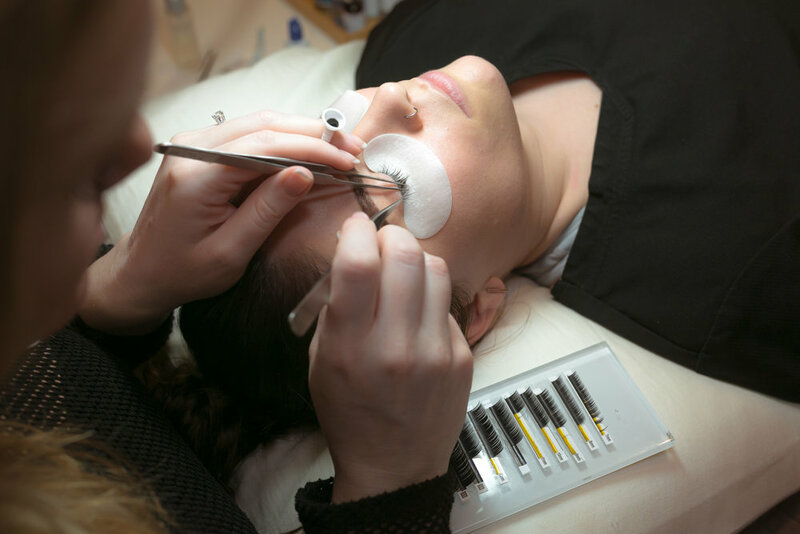 This means that in addition to seeking out technicians highly trained in proper application, clients must make sure that they are keeping their lashes clean. At the end of every LashBee full set application, clients receive a complimentary aftercare kit that includes a specialized lash shampoo. We recommend cleansing daily to keep oils from breaking down the adhesive bond and ensure those lashes stay squeaky clean. Myth 3: The lash extension application process is painful. LashBee: It should NEVER be painful! With a trained professional, you should barely feel anything more than a light touch. At LashBee, we treat our clients to comfortable beds, calming music, and cool collagen-infused gel pads. Not to mention, our clients’ eyes remaining closed the entire time. The process is so comfortable, some clients even take a nap! Myth 4: Lash extensions always look fake. LashBee: Definitely not! With so many varieties of curl, length, thickness and shaping, we can give you a look that's as natural (or dramatic!) as you like. We pride ourselves on applying extensions that enhance your natural beauty, not detract from it. Check out our Lookbook to see what we mean. Myth 5: Lash extensions make your natural lashes shorter and finer. LashBee: Sadly, if lashes are applied improperly, damage is possible. Poor application can cause natural lashes to weaken and fall out. Our biggest concern here at LashBee is safety, and we will never put our clients in extensions that could reduce the integrity of their natural lashes. Our priority is safe and healthy lashes for every client. Myth 6: You must periodically take breaks from lash extensions. LashBee: If your lashes were properly applied, you should not need to take a break! In the event that you did notice damage from improperly applied extensions, we do recommend strengthening your natural lashes with a growth serum. Try Revitalash, a best-selling serum that we retail at LashBee! Myth 7: You can apply lash extensions by yourself. LashBee: Making lashes last as long as we do requires medical-grade adhesive and specialized tools that are not safe for use by anyone without significant training. Further, our LashBee technicians wear magnifying glasses to ensure they see every lash clearly and can safely apply extensions to only one natural lash at a time. Your eyes are so important - we ALWAYS recommend visiting a highly-trained technician! Myth 8: Eyelash serum can’t be used while wearing lash extensions. LashBee: Some serums contain oils that could break down the extension adhesive. At LashBee, we carry Revitalash, which is completely safe for use with extensions. In fact, we encourage it! Myth 9: Removing lashes will cause damage to natural lashes. LashBee: Never try to remove semi-permanent lash extensions on your own! Either let them fall out naturally (the last lash will likely fall out six to eight weeks after the initial application) or come in to have them professionally removed. We use specially-formulated lash extension remover that will quickly and safely break down the adhesive. After a few minutes, your extensions will slide right off. Your eyes will be shut throughout the process. As long as you make sure to see a trusted and well trained LashBee technician, you will never experience any harm to your natural lashes! Are you BROWsing around for a brow tint? At Lashbee, we love full, defined brows. Right now throwing on some powder or a brow gel, which is fantastic, easily attains the chic look. Unfortunately, with a working woman's busy schedule, applying brow makeup can oftentimes be a chore. Thankfully, there is a solution for your brow makeup woes and that solution is a brow tint! Brow tinting is a super quick and popular service, which gives you effortlessly perfect brows. No daily upkeep is required, resulting in a streamlined morning routine with no fear of smudging! Brow tinting can be done in the same amount of time it takes to fill your brows in the morning, with longer lasting results. The service starts with a quick consultation with your esthetics expert about what type of look you desire. The vegetables based dye is then custom mixed to match your perfect color. The skin around your brows is primed with a skin protectant to prevent staining and the color is applied. It usually doesn't take long for the hairs to take on color. The color will sit for 5 to 10 minutes. Then the tint is removed and your skin is rinsed clean, leaving behind a rich color that lasts! The color will last on your hair for about a month, then you'll be ready to refresh your color. Brow tints are a great option if you are growing your brows out as well. There are fine hairs in the brow area that pick up the tint which reveals more hairs you may not have been able to previously see before. Voila, now you are one step closer to the fuller brows you want! Tinting isn't just a great option for growing in brows but for practically everyone. Having a slightly darker brow area adds defined structure to the face and enhances your eyes. Case in point, brow tints are truly a universal beauty service; there is an option for everyone. Preserving Your Extensions: How Often Should You Touch Up Your Lashes? Many clients who receive lash extensions often inquire about the timeframe that they should touch up their lashes. At LashBee, we recommend clients to come for lash fills every 2-3 weeks to maintain their newfound stunning lash look. Although this is the recommended time frame, lash fills often depend on the quality of the client’s aftercare. For instance, some clients maintain their lashes properly by cleaning them regularly, sleeping on their back, and by using lash-friendly products. The clients who take the utmost care of their lashes may not need to come back as often. It also depends on YOUR preferences! Some clients prefer mini-touchups weekly while others prefer a much longer fill once a month. How do you know when to come back? Generally, you will notice that your lashes are becoming sparse along the lash line. Sparse lashes are a major indication that the lash extensions are falling out. Luckily, with proper lash care, the likelihood of lashes becoming sparse is significantly reduced. Lash extensions require maintenance including being shampooed, brushed, and cared for. Check out some tips below! At LashBee, we're all about love for your lashes. We want you to wake up every morning absolutely loving your #iwokeuplikethis! Part of this lash love affair is making sure you take the best care of your lashes to give them a long, full life. These are our top tips! In your face wash, lotion or makeup remover, try to avoid glycol. More specifically, avoid anything with PEG (Polyethylene Glycol), Hexalene Glycol, or Propylene Glycol. Finally, don’t wait too long between fills! LashBee stylists are trained to safely remove and replace extensions that are growing out, never damaging your natural lashes. Coming back regularly ensures fresh lashes and an even look that makes you look bee-autiful! Skimming through your favorite style magazine or even walking about through the streets, you will most likely catch it out of the corner of your eye: almost too good to be true lashes. Did this passerby just happen to hit the genetic lottery or have a little help from humankind? Regardless of one’s own routine, fake eyelashes have claimed their stay in millions of womens’ beauty rituals globally. Despite the glamorous facade, falsies have not always had a stylish history. Follow along LashBee’s timeline to learn of the fascinating history of eyelash enhancements. Greater society’s eyelash fascination dates back to Ancient Egypt where androgyny was all the rage as both men and women coveted tinting treatments, ointments, and brushes to achieve fluttery, fanned out lashes. As time progressed, thousands of early Roman women endeavored to have the longest lashes as humanly possible after famed philosopher Pliny the Elder’s assertion that long lashes were a direct result of being chaste and of maintaining upright morals. In the 19th century, women took the famous quip that “beauty is pain” to the extreme as needling lashes to one’s own eyelid became a popular practice throughout European cities. Interestingly enough, nearing the end of the 1800’s, there were recorded historical accounts of eyelash extension experimentation with failed attempts of gluing lashes to the upper lashline. Hollywood film giant D.W. Griffith became an eyelash pioneer while shooting scenes for his directorial work, Intolerance, back in 1916. Upon watching outtakes of silent film actress Seena Owen, Griffith decided something visually lacked. The director's solution to said problem included transforming Owen’s eyelashes into a more “supernatural” form. The crew’s resident wigmaker was commissioned to gluing human hair lashes onto Owen’s lash line with spirit gum as the lash glue. As expected, Owen suffered a mild reaction as a result of using wonky lash glue. Luckily, they got the right shots before the eyelid progressed in the reaction. Fake eyelashes finally got the greenlight from the public after Vogue published numerous advertisements with models adorning the eye enhancements in a variety of bright colors and materials. Male journalists and other critics alike initially took to publicly bashing the beauty innovation. Angered columnists claimed that eyelash wearers were “temptresses”. Golden Age film icons including Rita Hayworth, Judy Garland, Marilyn Monroe, and Gene Tierney proudly sported falsies during Hollywood outings and for major photoshoots. Fake eyelashes became a staple in makeup artists’ kits as falsies elongated and opened client’s eyes. More innovation came about during the 1950’s when eyelash warehouses swapped human hair for plastic materials to mold fake eyelashes (which is still a widely used practice today). Departing from a more classic Hollywood glamour look, the 1960’s paved the way for bold, experimental, and daring makeup styles. Among the makeup trends included dramatically lengthened upper lashes with an added emphasis on the lower lash line (sometimes additionally painted on via the use of liquid eyeliner). Iconic supermodel Twiggy was known nationwide for her doll-like eye look and penchant for wearing stacked fake eyelashes. Like most trends, falsies faded for a brief period during the 1970’s and 1980’s (although “Goddess of Pop” Cher continued to don her favorite lash styles during her onstage performances). The era of the 1990’s experienced a resurgence of public interest in falsies after popular models such as Cindy Crawford, Anna Nicole Smith, and Pamela Anderson achieved an elegant bombshell look in the bat of an eyelash. In the 2000’s, falsies became a multimillion dollar industry as they started being manufactured internationally and sold in the likes of drugstores, high-end department stores, and by online retailers. In the early 2000's, semi-permanent lash extensions were innovated in South Korea & Japan, as strip lash wearers looked for a safe solution to have their lashes last longer. Extensions did not come to the U.S. until a few years ago. Kim Kardashian, reality star and contour queen, has popularized the more everyday glam aesthetic embraced by millions of young women worldwide. Lashes now have become a must-have for the current Instagram generation. Semi-permanent lash extensions finally provide a way to give natural looking lashes that would not just peel off. Lash addicts love the ease of lash extensions - you wake up with your lashes looking perfect! Additionally, lash lifts + tints have significantly progressed with innovation, giving even more options for those who want perfect curl with low maintenance. For lash novices, eyelash extensions and lash lifts are now the best, most innovative method in the beauty industry for long lashes. Interested in having your own eye makeover? Visit http://www.lashbee.com/book/ to browse our selection of signature lash options.